Only the seventh comet imaged using radar! (left) Delay-Doppler image of Comet 45P/HMP. Vertical resolution is 7.5 m/pixel. The comet’s shape is probably two lobes and is seen here to be about 1.3 km in size. (right) Gif composed of thirteen delay-Doppler images of Comet 45P/HMP after 2 hours of observation. Though not visible to the naked eye or even with binoculars, the green-tailed Comet 45P/Honda-Mrkos-Pajdusakova (HMP) did not escape the gaze of the world-renowned Arecibo Observatory. Scientists from the University of Arizona’s Lunar and Planetary Laboratory (LPL) and the Universities Space Research Association (USRA) at Arecibo Observatory have been studying the comet with radar to better understand its solid nucleus and the dusty coma that surrounds it. Studying the comet with radar not only very precisely determines its orbit, allowing scientists to better predict its location in the future, but also gives a glimpse of the typically unseen part, the comet’s nucleus, which is usually hidden behind the cloud of gas and dust that makes up its coma and tail. In fact, the new radar observations have revealed Comet 45P/HMP to be somewhat larger than previously estimated. The radar images suggest a size of about 1.3 km (0.8 mi) and that it rotates about once every 7.6 hours. “We see complex structures and bright regions on the comet and have been able to investigate the coma with radar”, indicated Cassandra Lejoly, graduate student at the University of Arizona. This comet is only the seventh imaged using radar because comets rarely come close enough to the Earth to get such detailed radar images. In fact, though 45P/HMP has an orbital period of about 5.3 years, it rarely passes close to Earth, as it is doing now. Comet 45P is one of a group of comets called Jupiter family comets (JFCs), whose orbits are controlled by Jupiter’s gravity and typically orbit the sun about every 6 years. Comet 45P/HMP, which is passing by Earth at a speed of about 23 km/s (relative to Earth) and a close approach of about 32 Earth-Moon distances, will be observed widely at different wavelengths to characterize the gas and dust emanating from the nucleus that forms the coma. As comets orbit the sun, the ices sublime from solids to gases and escape the nucleus. The nucleus gradually shrinks and will disappear completely in less than a million years. 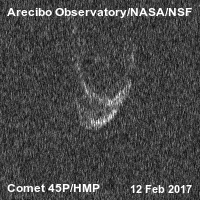 Radar observations at Arecibo of Comet 45P/HMP began on February 9, 2017 and will continue through February 17, 2017. The Arecibo Observatory is a facility of the National Science Foundation operated under cooperative agreement by SRI International in alliance with the Universities Space Research Association and Universidad Metropolitana. The Planetary Radar Program at Arecibo is fully funded by NASA through two grants from the Near-Earth Object Observations program and managed by USRA. Universities Space Research Association is an independent, nonprofit research corporation where the combined efforts of in-house talent and university-based expertise merge to advance space science and technology. USRA works across disciplines including biomedicine, planetary science, astrophysics, and engineering and integrates those competencies into applications ranging from fundamental research to facility management and operations. USRA engages the creativity and authoritative expertise of the research community to develop and deliver sophisticated, forward-looking solutions to Federal agencies and other government sponsors. Any opinions, findings, or recommendations expressed here do not necessarily reflect the views of Arecibo Observatory, the National Aeronautics and Space Administration (NASA), the National Science Foundation (NSF), the National Astronomy and Ionosphere Center (NAIC), University of Central Florida (UCF), Universities Space Reseach Association (USRA), Universidad Metropolitana (UMET), Yang Enterprises Inc., or any of the business partners of the Arecibo Observatory. This website is maintained by Dr. Anne Virkki and Dr. Edgard G. Rivera-Valentin.